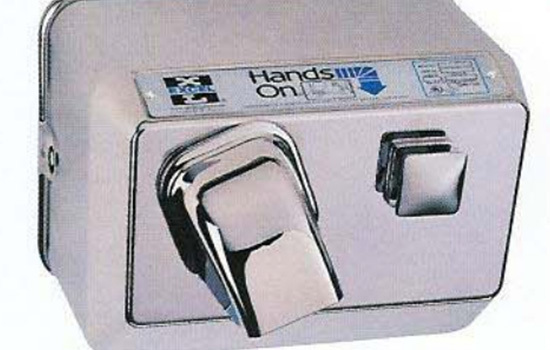 The last impression your bathrooms make is the quality of hand dryer that you have installed. If you prefer customers and employees exit the bathroom without still dabbing their hands on their pants or uniforms, we can help. We offer quality hand dryers, including Excel’s American Made dryers, which have provided cost effective hand and hair dryers for schools, hospitals, office buildings, factories, restaurants, hotels, stadiums, movie theaters and health clubs. The heating element produces an air temperature of 145 degrees and is protected by an automatically resetting circuit breaker. Concealed timer operates the hand dryer for 30 seconds and the hair dryer for 180 seconds. A 10 year unlimited warranty that includes damage from accidents, misuse, and vandalism. We are certain that we have the right hand or hair dryer to meet your needs and the staff to help you make the perfect choice. Fill out the form below and one of our experts will contact you to evaluate your needs and give you a personalized and competitive quote. It's an open-and-shut case. Commercial Openings is the best in the business. We are your commercial door specialists.